Is it snowing in Deer Valley ?¡Gracias! 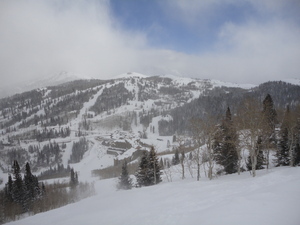 Deer Valley, in the United States (Utah State), is a large resort with 17 lifts (17 chair lifts) that offers skiers an impressive 914 metres (3000 feet) of vertical descent. 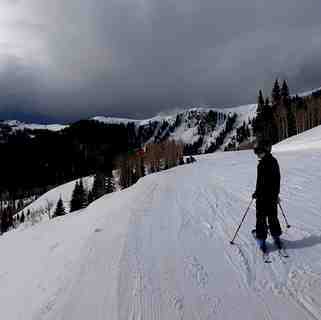 Deer Valley has 1825 acres of terrain over 84 trails. Deer Valley was named the #1 ski resort in North America by readers of SKI Magazine an impressive three years in a row - in 2008, 2009 and again in 2010. 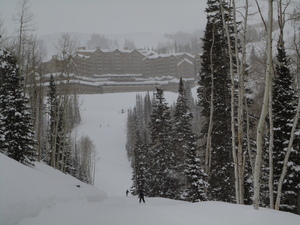 About one quarter of the trails at Deer Valley are covered by snow-making. The nearest airport is at Salt Lake City and the nearest train station to Deer Valley is also at Salt Lake City. Deer Valley will host another Freestyle World Cup event this season! Competitors from around the world will challenge each other and themselves on Deer Valley's 2002 Olympic runs. The first of two mogul competitions on Deer Valley's Champion ski run will take place Thursday afternoon, January 14, beginning at 1:15 p.m. The aerial competition will take place Friday night, January 15, under the lights on Deer Valley's White Owl ski run, beginning at 8 p.m. The second mogul competition will take place Saturday night, under the lights and will begin at 8 p.m. Thursday night, January 14, will include live entertainment on Main Street, near the Town Lift Plaza, followed by fireworks. All events, including the concert, are free to the public. Please note: additional parking for the concert will be available at Deer Valley Resort. Please utilize the free City transportation to and from Main Street. For an enhanced spectator experience at Deer Valley, Freestyle Feast event tickets are available for either dinner on Friday or Saturday for $80, or lunch on Thursday for $65 in the VIP tent and include a commemorative gift. Tickets can be purchased beginning Saturday, December 5, by calling 435-645-6510, 8:30 a.m. to 5 p.m., daily. Please note: A maximum of six tickets can be purchased per person. The competitions will air on NBC Saturday, January 23 at 1:30 p.m. EST and on Versus Sunday, January 24, at 5 p.m. EST and Sunday, January 31 at 4 and 5 p.m. EST. -The lift lines are poorly run. Ski school gets unreasonable preferential access. Beginner skiers use high-speed lift and cause continuous stoppage and delays. Student skiers dominate numerous runs (vs. a small number of dedicated beginner runs for students) to the detriment of others. -Overall, the employees are less friendly and inviting. I have never been so disappointed as I was during this last trip to DV. I may go elsewhere going forward. They can't charge top-dollar while allowing the product to deteriorate. I will gladly pay-up for top notch but not for mediocre.